An algorithm that extends an artificial-intelligence technique to new tasks could aid in analysis of flight delays and social networks. In technical terms, the researchers’ work concerns probabilistic graphical models. 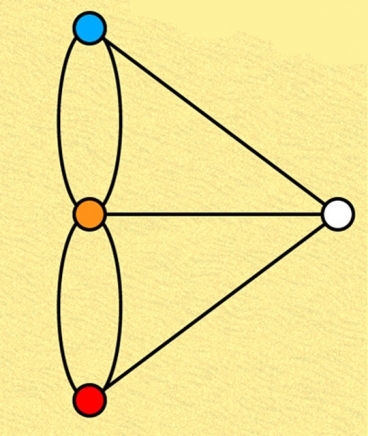 In this context, a graph is a mathematical construct that consists of nodes and edges, usually depicted as, respectively, circles and the lines that connect them. A network diagram is a familiar example of a graph; a family tree is another. Graphical models simplify reasoning about data correlations because they eliminate the need to consider certain dependencies. Suppose, for instance, that your artificial-intelligence algorithm is looking for diagnostically useful patterns in a mountain of medical data, where the variables include patients’ symptoms, their genetic information, their treatment histories, and prior diagnoses. Without the graph structure, the algorithm would have no choice but to evaluate the relationships among all the variables at once. But if it knows, for instance, that gene “G” is a cause of disease “D,” which is treated with medication “M,” which has side effect “S,” then it has a much simpler time determining whether, for instance, “S” is a previously unidentified indicator of “D.” A graphical model is a way of encoding those types of relationships so that they can be understood by machines. In prior work, Liu and Willsky showed that efficient machine learning can still happen in a “loopy” probabilistic graph, provided it has a relatively small “feedback vertex set” (FVS) — a group of nodes whose removal turns a loopy graph into a tree. In the airline-flight example, many of the nodes in the FVS were airline hubs, which have flights to a large number of sparsely connected airports. The same structure is seen in other contexts in which machine learning is currently applied, Liu says, such as social networking..